EASE published a position paper explaining the multi-service business case approach whereby multiple stakeholders are together involved in the ownership, development, management, and/or operation of an energy storage facility in order to maximise its social welfare by fully deploying all services storage can deliver. EASE and Delta-ee are pleased to announce the publication of the third edition of the European Market Monitor on Energy Storage (EMMES). Behind-the-meter markets continue to develop positively across Europe, with growing opportunities for energy storage in C&I and residential applications in Central & Eastern Europe, Spain and the Nordics. Political negotiations on the “Clean Energy for All Europeans” package (CEP) were concluded in December 2018, and the new electricity market design should be enacted into Member States national legislation over the next 18 months. This promises to deliver important changes that could have a significant and positive impact on the energy storage market in Europe. While the market is forecast to grow in 2019 and 2020, it will do so at a lower rate due to the short-term saturation of some front-of-the-meter markets, and the maturing of the large German residential market. However, new growth drivers will emerge as the CEP is enacted and we expect E-mobility to become a significant new application for stationary energy storage. Download the Delta EE – EASE EMMES Synthesis! Ready to read the definitive guide for the European Energy Storage Market? The consultation exhamines how future EIB backed investment can reduce energy consumption through energy efficiency, better support renewable power generation, improve financial and advisory backing for energy innovation and secure infrastructure essential for energy transition. Read the full response to the public consultation here. EASE submitted a response to the European Commission’s Public Consultation on the “European Commission’s Delegated Regulation establishing the Innovation Fund”. The EC legislative proposal for a revised EU emissions trading system (ETS) reform involves the creation of an Innovation Fund (IF). This fund is meant to support low-carbon innovative technologies, including energy storage technologies, by allocating funds to demonstration projects or projects between TRLs 6-9. It will be financed through the earmarking of revenues from the sale ETS allowances. Given the importance of the funding that could be available to energy storage projects in the future, EASE drafted a reply to the public consultation. EASE has submitted a response to the European Commission’s Public Consultation on the Strategy for Long-Term EU Greenhouse Gas Emissions Reductions. Our members are fully supportive of the EU’s efforts to achieve a low-carbon economy, and we support ambitious greenhouse gas emissions reduction targets. We hope that the long-term EU greenhouse gas emissions reductions strategy will take into account the vital role of storage. You can read EASE’s consultation reply here. In the framework of the Electricity Coordination Group, which gathers electricity experts from each Member State, the European Commission launched an informal public consultation on the future of energy storage in the EU. The European Association for Storage of Energy (EASE) published a position paper explaining the crucial role of stationary energy storage in enabling a rapid and effective transition to a decarbonised transport sector. It calls on policymakers and other stakeholders to address the barriers that hamper the uptake of storage and to enable relevant use cases. On 5 June 2018, the European Association for Storage of Energy (EASE) published a study estimating the energy storage capacity that would be needed in order for Europe to achieve its decarbonisation targets. EASE submitted a response to the European Commission Public Consultation on the “Establishment of the ETS Innovation Fund”. The EC legislative proposal for a revised EU emissions trading system (ETS) reform involves the creation of an ETS Innovation Fund (IF). This fund is meant to support low-carbon innovative technologies, including energy storage technologies, by allocating funds to demonstration projects or projects between TRLs 6-9. It will be financed through the earmarking of revenues from the sale ETS allowances. The European Commission has published a public consultation on the design elements of the ETS Innovation Fund. EASE submitted a response to the ENTSO-E Public Consultation on “All Continental European and Nordic TSOs’ proposal for a Cost Benefit Analysis methodology”. EASE welcomes the efforts by ENTSO-E to propose a methodology suitable for assessing the time period required for FCR providing units or groups with limited energy reservoirs (LER) to remain available during alert state in Continental Europe (CE) and Nordic synchronous areas. Normal state, pre alert state, alert state and emergency state parameters should be clearly defined to correctly run the CBA: these parameters should be based on the definitions of the System Operation Guideline and if not possible, more clearly defined in the draft CBA methodology. If we support the ENTSO-E proposal to analyse the sizing of LER-FCR reservoirs during the pre-alert and alert states, we also believe that all other states should be analysed in order to correctly size these reservoirs. The FRR behaviour should also be clearly defined in terms of the amount of energy provided by this service and the way this energy is provided in time, since this can have an important effect on FCR provision. There should be more transparency regarding the relevant frequency profiles and historical data used to determine the different scenarios and Monte Carlo sampling assumptions. Incidents older than 10 years should not be taken into consideration because they do not reflect the current electricity system behaviour. The correlation between long lasting frequency deviations and power outages should be taken into account to produce a more precise evaluation. Regarding the economic approach needed to evaluate the cost-benefit impact of the FCR provision, more information should be given on how the costs will be determined. First, an evaluation of the technical requirements for FCR, taking into account system needs in terms of security and reliability. EASE is pleased to announce a partnership with Delta-ee, which sees EASE publish the first edition of the European Market Monitor on Energy Storage (EMMES). Our analysis indicates that in 2017, the energy storage market has grown 50% compared to the previous year. Published twice per year, the report offers a comprehensive geographical coverage of energy storage installations in Europe, broken down into 8 regions: Germany, United Kingdom, Italy, France, Iberia, Nordics, Central/Eastern Europe and rest of Europe. Each edition includes an overview of EU policy and future changes, a forecast of the European storage market in 2018 and an overview of the thermal storage market. 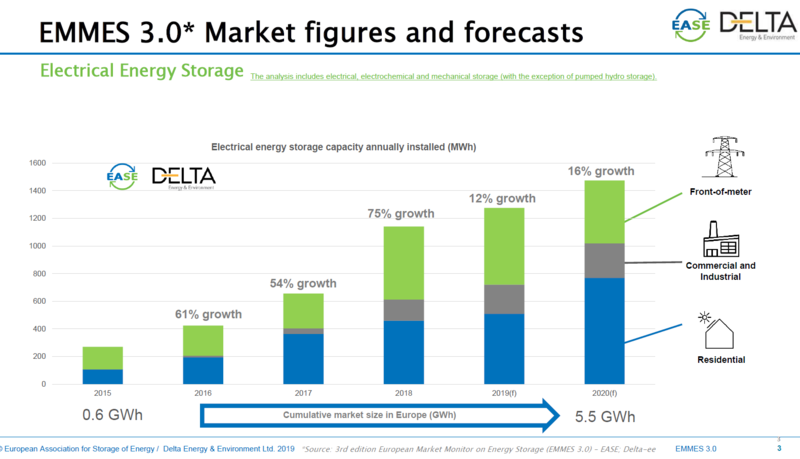 The European Market Monitor on Energy Storage covers different energy storage technologies and markets, allowing industry players and other experts to stay up-to-date on the fast-changing energy storage market. The report analyses the energy storage installed base in the residential, commercial & industrial and front-of-meter sectors. EMMES is based upon primary research conducted in collaboration with leading companies and stakeholders, including EASE Members. Did you miss the Launch Webinar on 18 January? The roadmap provides a comprehensive overview of the energy storage technologies being developed in Europe today and identifies the RD&D needs in the coming decades. On this basis, the roadmap provides recommendations for R&D policies and regulatory changes needed to support the development and large-scale deployment of energy storage technologies. The aim is to inform policymakers for research, innovation, and demonstration in the energy storage sector in order to further strengthen Europe’s research and industrial competitiveness in the energy storage industry. EASE, the European Association for Storage of Energy, has published its position paper “Thermal Energy Storage” (TES), which highlights the role of TES in supporting the energy transition. Assess the benefits and (market) potential of thermal energy storage options for prosumers, industry, and communities, among other flexibility solutions; improve efforts to communicate the role and benefits of thermal storage. Implement non-discriminatory market incentives and regulatory frameworks across the EU for flexibility solutions. Support demonstration and deployment projects for (new) integrated solutions which incorporate pre-commercial thermal energy storage options in smart energy systems to reach the required flexibility at lowest system costs. Developing a certification system for production pathways of Green Hydrogen and Green Synthetic Fuels. Developing comprehensive and fair life cycle assessment (LCA) methodologies for assessing GHG emission savings from renewable and low carbon fuels in the overall system to evaluate an adequate remuneration scheme for those savings. Promoting sectoral integration by reducing the barriers between the different energy and economic systems (mobility, industries, heating, etc.). This includes especially those fees and taxes applied when energy is transferred from one sector to another. Developing a coherent remuneration system for flexibility services. Creating a level playing field for Green Hydrogen and green fuels/blending components when used in refineries or during the fuel production process by classifying them as advanced biofuels under the revised Renewable Energy Directive (RED). Reducing the economic gap by promoting, especially through EU funds, the development of pilot projects. EASE has published its position paper “Energy Storage Deployment Hampered by Grid Charges”, which highlights the significant differences in grid charges across countries to which large-scale pumped hydro storage (PHS) power plants are exposed today. It illustrates the impact of the currently fragmented regulatory framework on energy storage competitiveness in general and how it is hampering the creation of an internal energy market. In its paper, EASE calls for a coordinated approach to defining grid tariffs for storage that recognises its alleviative effects on grid constraints and grid extension costs, while contributing to reduced curtailment of CO2 free electricity generation. The Grid+Storage consortium is glad to announce the publication of their draft research and innovation (R&I) roadmap 2016-2025, integrating for the first time energy storage issues into electricity network activities. The development of this integrated roadmap has been based on a thorough monitoring of past and ongoing research projects and on the gathering of research and innovation needs identified by European stakeholders during 9 regional workshops. All stakeholders of the electricity value chain and of other energy networks are invited to provide feedback about the detailed activities foreseen in the roadmap which should drive the energy storage and smart grids R&I strategy at European level for the next decade. About Grid+Storage: Complementing the activities performed so far by the European Electricity Grid Initiative (EEGI) and the Grid+ project, a consortium formed by TECHNOFI, EASE, EDSO, ENTSO-E, RSE and VITO has been selected by the European Commission to support DG Energy and the Member States in defining a European R&D roadmap integrating energy storage into grid research and innovation activities, both at electricity transmission and distribution levels. More information at http://www.gridplusstorage.eu/. EASE responded to ENTSO-E’s public consultation on the next European Cost Benefit Analysis Methodology (CBA 2.0). EASE welcomes the updated CBA 2.0 and the transparent process reflected in this consultation. However, we would like to see the dedication to transparency continue beyond the consultation, extending to the assessment of TYNDP projects by ENTSO-E regional groups and to the assessment of Projects of Common Interest (PCIs) by EU Regional Groups. The current process for ranking projects seems rather opaque. EASE welcomes ENTSO-E’s efforts to clearly explain the difficult notions contained in the CBA 2.0 methodology. One potential further improvement would be to explicitly highlight the modelling complexity to give a sense to the non-modelling reader that models can be limiting. We would welcome an annex that includes more descriptions of the current models used in order to further the reader’s understanding of potential limitations and areas of improvement. Throughout the CBA 2.0 methodology, it is unclear whether the socio-economic welfare (SEW) indicator refers to gross SEW or net SEW (the difference between the socio-economic welfare and the investment costs of the project). EASE supports presenting “net SEW” as the final result. Regarding the assessment of Energy Storage projects, EASE notes that there are additional indicators for storage, which may render a comparison with conventional transmission projects more difficult. The modelling of Energy Storage projects in the CBA 2.0 seems to rely on strong simplifications, which may hamper a true assessment of the benefits of some Energy Storage plants. EASE submitted a response to DG Research and Innovation’s public consultation on the development of a comprehensive, integrated Research, Innovation, and Competitiveness Strategy for the Energy Union. EASE fully supports the development of an Integrated Energy Union Research, Innovation and Competitiveness Strategy which ensures that research and innovation efforts contribute to making Europe the world’s leader in renewables & low-carbon technologies and solutions while maintaining a competitive industrial base. One of the most urgent challenges for research and innovation to support the low-carbon transformation is achieving the full deployment of Energy Storage. The development of innovative technologies that increase storage capacity and performance should be encouraged. Support to research and innovation should be driven by a careful assessment of which technologies provide the largest overall benefits in terms of decarbonising the energy system. Renewable subsidies for mature technologies should be eliminated and non-discriminatory access to technologies which can facilitate the economic growth of renewables (such as Energy Storage) should be facilitated through market-based regulation. However, support to research and innovation will not in itself lead to the full deployment of available technologies. Research and innovation efforts must be complemented by steps to tear down regulatory barriers to allow for the use of valuable and innovative technologies. One of the priority measures to ensure that citizens support the transition to a low-carbon economy is to establish electricity retail tariffs that properly reward consumer behaviour and encourage the deployment of small-scale renewable energy sources and Energy Storage technologies. EASE has published its Activity Report for 2018. Discover more about our activities and what to expect for 2019. EASE has published its Activity Report for 2017. Discover more about our activities and what to expect for 2018. EASE has published its Activity Report for 2015. It includes activities from January 2015 to December 2015, with a specific focus on the 2nd Energy Storage Global Conference and Market Design. This document was prepared by the TVAC WG1 on Technology Facts. EASE responded to DG Energy’s Public Consultation on the Preparation of a new Renewable Energy Directive for the period after 2020. We believe that providing confidence for investors and producers of renewable energy is important. EASE calls for subsidies for mature renewable technologies to be eliminated. We also call formarket-based regulation, which allows for a non-discriminatory access to technologies, such as energy storage, facilitating economic growth and the further integration of the RES into the energy system. EU-level support to research and innovation (R&I) for novel renewable energy technologiesneeds to be assured. Additionally, research efforts should focus on the proper integration of renewables into the grid, relying on technologies such as energy storage and smart grids. A mechanism needs to be found to properly reward consumer behaviour and to encourage thedeployment of small-scale RES and energy storage technologies. The storage of heat and cold by use of different storage technologies is key for the success of the EU’s decarbonisation efforts. EASE responded to DG Energy’s Public Consultation on a new Energy Market Design. EASE would like to stress that the future governance framework of the Internal Energy Market needs to incorporate regulatory changes creating a separate asset category and rules for electricity energy storage systems. This is necessary due to their dual generation and demand nature. The new asset category should recognise the contribution energy storage systems will make to system security, loss reduction and the provision of other ancillary services on the T&D networks. In terms of regulatory oversight and the future role of ACER, EASE thinks the procurement of ancillary services and the way tariffs for transmission network use of system charges are estimated and applied, must also be made transparent across Europe to provide the right investment signals for providers of flexibility (i.e. energy storage and DSR operators). EASE appreciates the increasing interest in the electrification of heating and cooling and the storage of heat and cold by help of different storage technologies as a means to support the transition of the European energy economy into an energy economy based on sustainability and RES. Heat and cold storage is capable not only of providing flexibility to heating appliances based on heat coming directly from RES such as solar thermal heating but also of supporting the integration of the heat and electricity sector (e.g. by means of Smart electric thermal storage (SETS)) and electric heat pumps). Therefore EASE is convinced that the potential role must be explicitly described and the current regulatory barriers for heat and cold storage must be highlighted in order to allow the full potential of this technology to be made use of. By retrofitting of existing installations such systems could contribute to carbon saving of several million tonnes per year in the EU. In December 2015, the 21st Conference of the Parties (COP 21) of the United Nations Framework Convention on Climate Change (UNFCCC) takes place in Paris, France. The main objective of the annual Conference of Parties is to review the adoption of the UN Framework on Climate Change (UNFCCC). The 2015 Paris Climate Conference will aim, for the first time in over 20 years of UN negotiations, to achieve a legally binding and universal agreement on climate, with the goal of keeping global warming below 2°C. In this framework, EASE would like to present a paper to highlight the importance of Energy Storage as a Decarbonisation Enabler as well as the challenges ahead of us. EASE participated to the Heating and Cooling Forum organised by the European Commission. Read our full response to the Issue Papers I to V here. EASE responded to ACER’s call for comments on the Network Code on Emergency and Restoration. through a non-discriminatory consideration of and a fair treatment for energy storage at national level alongside other measures. EASE has responded to the Public Consultation of DG Energy on the Retail Energy Market. specific storage regulation and market mechanisms for flexibility in combination with a new market design will help to create energy storage markets and will contribute to the development of a competitive energy storage industry in Europe. a market design that allows specialised energy storage operators to emerge, as long as this does not trigger market distortion. For more information, please check the EASE response and the accompanying document. EASE has responded to the Public Consultation Paper of the Services of DG Competition containing Draft Guidelines on environmental and energy aid for 2014-2020.
electricity storage will contribute to provide services and value to the entire energy system. EASE also takes this opportunity to provide feedback, offer expertise and ask for a level playing field for all energy storage technologies in a constructive dialogue with the European Commission (EC). The definition of storage should […] not be restricted and should include a wider concept of Energy Storage, compared to the current reference to Electricity Storage. Different technologies and concepts are included in the concept of Energy Storage and the selection is expected to be mainly based on the device location and on the different services provided by the device. Moreover, the concept and the value of energy storage technologies must be considered comprising itscapabilities in transferring energy between sectors (e.g. power to gas, hybrid electric vehicles, heat storage…). Energy storage allows for the use of more RES by avoiding curtailment when there is too much intermittent generation (e.g. solar photovoltaic and/or wind). This service should therefore beremunerated. EASE strongly believes that the use of energy storage must be technologically neutral: each case must adopt the most suitable technological and economic solution. Therefore the wording must be open and not technically discriminatory. Equal consideration of energy storage as a solution for enhanced grid flexibility, stability and quality along with other technologies. that any measures to ensure generation adequacy, such as potential future capacity markets/payments, or to balance the energy system must be shaped in such a way thatevery energy storage technology is eligible to participate without discrimination, provided it is able to fulfil the technical requirements. The EASE response to the ENTSO-E public consultation on the Network Code on Electricity Balancing has just been published on our website. EASE welcomes the Network Code on Electricity Balancing as a tool to foster effective competition, non-discrimination and transparency in markets. It will further help driving the way to a more harmonised pan-European balancing market. EASE believes that the Network Code on Electricity Balancing should ultimately lead to a harmonised framework for a pan-European Balancing Market. The Network Code should be designed as a driver for this evolution. In order to foster the participation of emerging technologies – such as energy storage and demand response – and renewable energy sources, aggregation should be facilitated for both load and generation entities. The evolution of the energy system is likely to trigger the need for balancing products with faster response times and particularly more accurate response curves. The Network Code should not hinder the development of products that are capable of delivering such services. Obligations for market players to put up their unused capacity for bids in the balancing market may prevent market entry of potential players, thus hindering rather than supporting the intended development of markets and competition. They risk enhancing rather than reducing market distortions. On 27 March 2013, the European Commission published a Green Paper presenting an overview of the issues that must be considered in the development of a 2030 Framework for Climate and Energy Policies. This Green Paper served as the basis of a stakeholder consultation on the development thereof. An optimisation of instruments such as the EU ETS to help driving investments forward provided that it can function efficiently (and thus deliver on its principle of a market-based and technology neutral means of CO2 reduction). THINK is an FP7-financed project that advised the European Commission (DG Energy) on a diverse set of energy policy topics (June 2010 until May 2013). EASE responded to a public consultation on Topic 8: “Electricity Storage: how to facilitate its development and deployment in the EU?“. EASE responded to the public consultation intended to help prepare a Communication to inform the EU’s renewable energy policy for the period post 2020. This complements a Communication on the Internal Energy Market also planned for next year which will also help inform the evolution of the EU’s wider energy policies following on from the Energy 2050 Roadmap. EASE has commented the LFCR Network Code from 28.06.13, in particular Article 45.6 concerning Frequency Containment Reserve (FCR). EASE recommends that technical rules and potential market designs regarding ancillary services (including FCR) should be shaped in such way that, without discrimination, every energy storage technology meeting the actual requirements must be eligible to participate. EASE members welcome the European Commission’s Energy Roadmap 2050 of 15 December 2011, particularly as this communication recognises the vital role of storage technologies for a progressively decarbonised European energy system. ENTSO-E has asked EASE to provide insights on a CBA for energy storage projects, an assessment to be used for the evaluation of storage devices on transmission systems. EASE delivered the requested input commenting on the validity and suitableness of the proposed indicators for energy storage projects, and developing a specific environmental indicator “social and environmental sensibility’ for energy storage technology. EASE has published its Activity Report for 2014. It includes activities from January 2014 to December 2014, with a specific focus on, amongst others, the Energy Storage Global Conference and the Energy Storage Definition. EASE has published its second Activity Report. It includes activities from January 2013 to December 2013, with a specific focus on the restructuring of the Association. Dowload the full version here. EASE and EERA have joined their knowledge to produce a comprehensive Roadmap describing the future European needs for energy storage in the period towards 2020-2030. The Roadmap also gives recommendations on the developments required to meet those needs. EASE has published its first annual Activity Report. The first edition includes activities from September 2011 – EASE creation – to December 2012.